A mineral is a naturally occurring combination of specific elements that are arranged in a particular repeating three-dimensional structure or lattice. 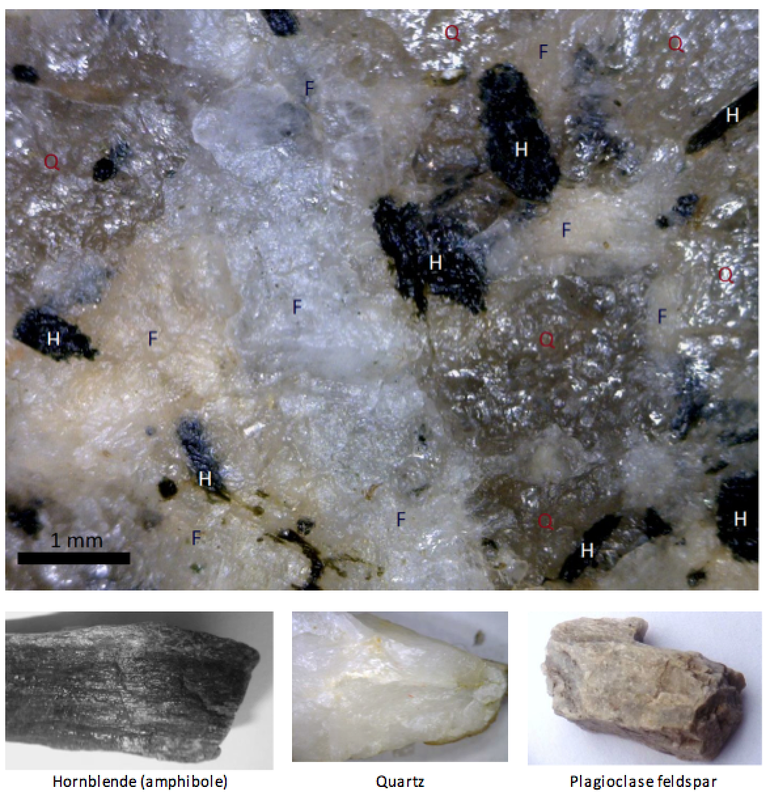 The mineral halite is shown as an example in Figure 1.4. In this case, atoms of sodium (Na: purple) alternate with atoms of chlorine (Cl: green) in all three dimensions, and the angles between the bonds are all 90°. Even in a tiny crystal, like the ones in your salt shaker, the lattices extend in all three directions for thousands of repetitions. 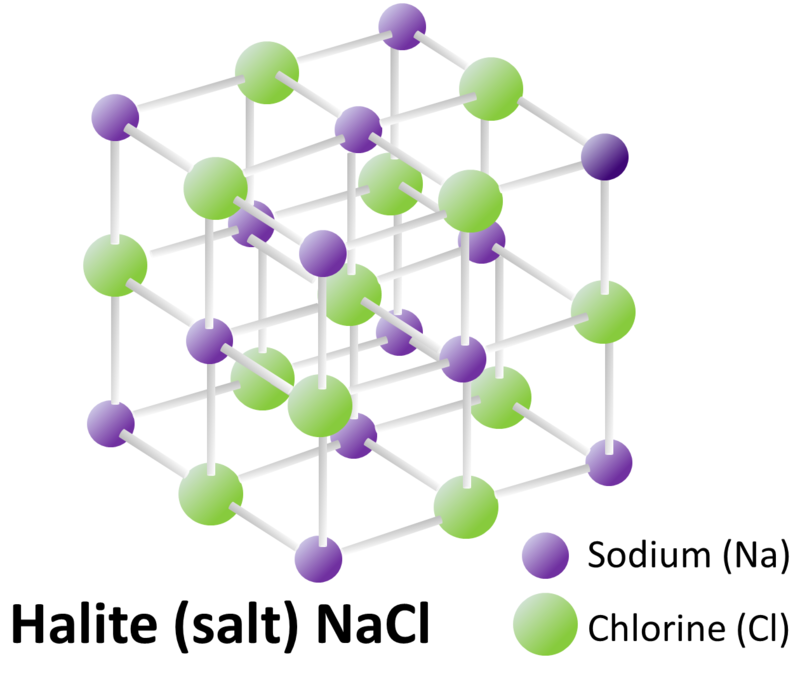 Halite always has this composition and this structure. Note: Element symbols (e.g., Na and Cl) are used extensively in this book. In Appendix 1, you will find a list of the symbols and names of the elements common in minerals and a copy of the periodic table. Please use those resources if you are not familiar with the element symbols. There are thousands of minerals, although only a few dozen are mentioned in this book. In nature, minerals are found in rocks, and the vast majority of rocks are composed of at least a few different minerals. A close-up view of granite, a common rock, is shown in Figure 1.5. Although a hand-sized piece of granite may have thousands of individual mineral crystals in it, there are typically only a few different minerals, as shown here. Select a sample of granite and, referring to Figure 1.5, see if you can identify some of the minerals in it. It may help to break it in half with a hammer to see a fresh surface, but be careful to protect your eyes if you do so. You should be able to see glassy-looking quartz, dull white plagioclase feldspar (and maybe pink potassium feldspar), and black hornblende or, in some cases, flaky black biotite mica (or both). Previous: 1.3 What Do Geologists Do? 1.4 Minerals and Rocks by Steven Earle is licensed under a Creative Commons Attribution 4.0 International License, except where otherwise noted.